As some of you may be aware, many parts of our City has suffered an increase in criminal activity in recent months. The increased crime did not go unnoticed by the SICID management and behind the scenes we have been working very hard to make a positive contribution to combating crime and stemming this new increase. The SICID management and Public Safety Service Provider meet with local SAPS officials and Law Enforcement on a weekly basis. In doing an analysis of crime with our primary crime fighting partners, the SAPS and Law Enforcement, the analysis showed how the crime incidents are of different types, times of the day and days of the week. We also noted that most of the reported crimes are on private property. The other incidents of crime is mostly motor related crime, either theft of motor vehicles or theft from motor vehicles. In the case of theft of motor vehicles, the focus seems to be on older model vehicles that are easy to steal. On further investigation we can also note that the theft of vehicles has mostly happened during the daytime while property related crime mostly occur at night. 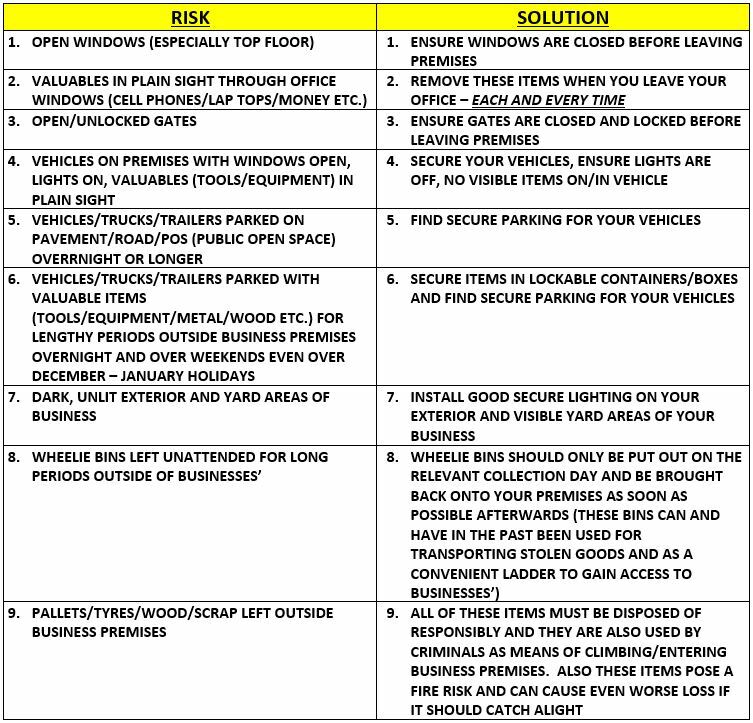 Sadly, we recently also noticed that more and more property owners are becoming apathetic towards the safety of their property and goods and we would like to suggest the following good practices/preventative measures to prevent loss/theft.